The construction of the Khimsar fort was started in 1523 by Rao Karamsji, eighth son of the founder of Jodhpur Rao Jodha. 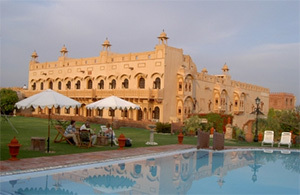 The Khimsar Fort is currently a premium heritage hotel. The 50 rooms at the hotel offers luxury in grand and delightful ambience. Open spaces, courtyard encompassing the rooms, stone carved surfaces, windows and curves are normal for this fort. A piece of the fort still structures the living arrangement of the royal family of Khimsar. Khimsar Fort hotel provides the luxuries like Swimming Pool, Yoga, Sauna Steam shower, Health club and Tennis court, Gymnasium, Tennis Court, Table Tennis, Billiards/ Snooker. Sand Dunes Village was built in 1523 by Rao Karamsji who was the founder of the line of Karamsji. 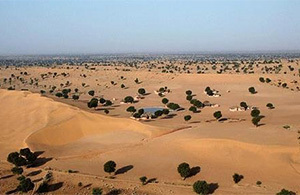 Khimsar Sand Dunes Village is approx 6 km away from the Khimsar Fort. 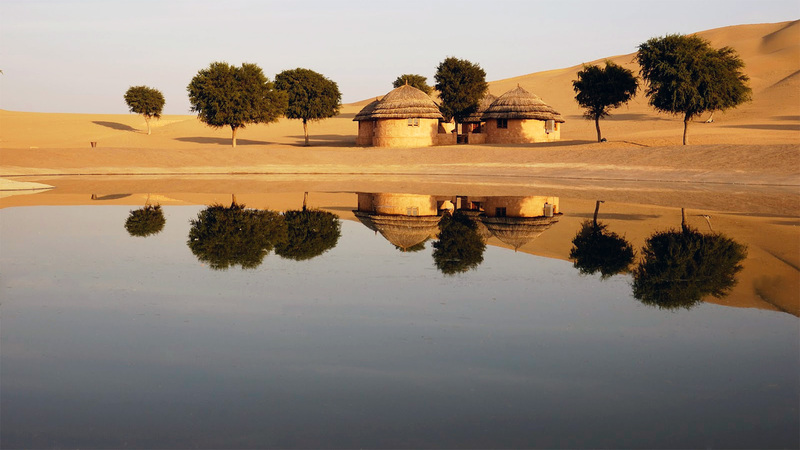 The Sand Dunes Village can be reached by jeep, camel or stallion, yet once there, all that is evident to the bare eye is moving sand dunes in every direction. 16 luxuriously appointed Huts with joined bathrooms 16 "dhani" style huts, with independent courtyards situated in a bunch facing the water body.